Our exclusive heavy-duty diabetic cold weather socks keep feet warm and dry. Feature non-binding top, low-profile toe seam and super-cushioned foot bed for healthy feet. 2 pairs. Medium, fits women’s shoes sizes 7–9, men’s 5 1/2–7 1/2; Large fits women’s 9+, men’s 7–12. 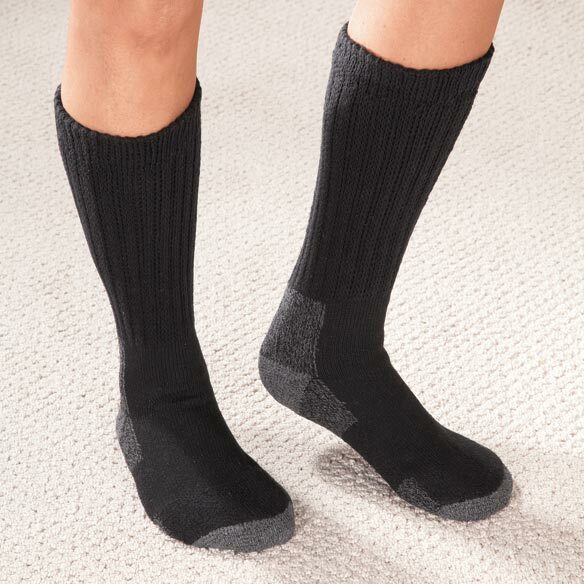 Our diabetic socks for cold weather are machine-washable 55% cotton/44% polyester/1% spandex. They are comfortable. They actually keep my swelling down. I will recommend these to anyone who has swelling issues. Tried a pair and liked the quality. I have ordered these for my husband before, and he loves them. l have looked in all of the store here for socks, all we can find is crew stocks, and not just size 12. My husband has cold feet all year long as well as swelling and these socks look like they will meet his needs. I have six pairs in white, now ordering black. I wear a black boot-brace on one foot, and these socks are the perfect height for folding over the knot to keep the laces from falling down. Usually the socks are covered by a pants leg, but the black will help me keep from being conspicuous. They also are very protective of toes and very cushion-y to walk on. I expect to wear them year-round in our mild climate. I am going to iceland on vacation and need warm not binding socks. they look thick and very warm!! We have used the item before and we liked it. My husband is diabetic and much foot and leg swelling. To keep my toes warm. I ordered these because I already have 2 pair & they are the best socks I have ever had !!! I live in Kansas and winters are cold. Normal winter/warm socks make my legs swell up terribly, but my feet get so cold, I have to have something warm on them in the winter. I chose these for my 101 years young mother who told me this morning that her feet and legs were swelling to twice their normal size. I live in WA state and she is in KS so I can only shop online for what I know will work and be shipped directly to her.I knew what to look for because my late husband was diabetic and this was the type that would stretch without binding on his legs. 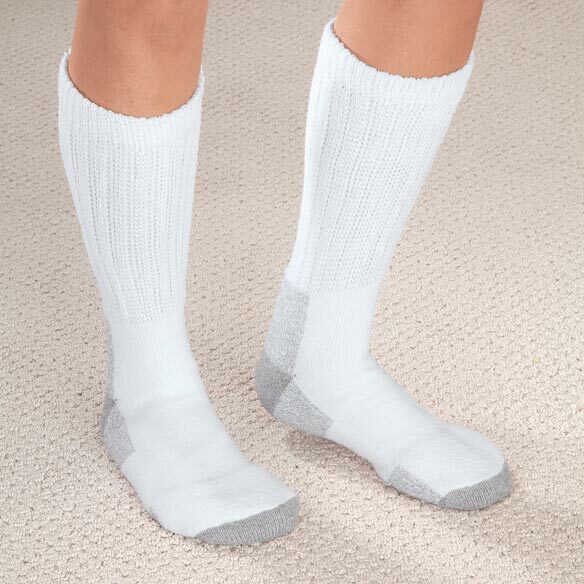 wanted non-compression, high rise socks. From other comments. Looks like they will keep my feet warmer. Hopefully they will be warm. It is hard to review an item before you have seen or used the item!!!!!!!! My husband's feet get very cold due to his diabetes. I needed good quality cold weather diabetic socks. I did NOT choose black! I have rather heavy legs calf 16 inches so will the large fit my calf? BEST ANSWER: Thank you for your question. They have a lot of stretch so they will fit a 16" calf. We hope this information will be of help to you. How to get mens sides? BEST ANSWER: Thank you for your question. Medium, fits women’s shoes sizes 7–9, men’s 5 1/2–7 1/2; Large fits women’s 9+, men’s 7–12. We hope this information will be of help to you. Medium fits womens shoe size 7-9 and mens shoe size 5 1/2-7 1/2. BEST ANSWER: Thank you for your question. These socks do not come in XL. We hope this information will be of help to you.